We provide data management services, biostatistical analysis, quality control and external audits of clinical centres, as well as organising the investigators’ start-up and follow-up meetings. We arrange contracts with the study sites and the investigators, provide legal/regulatory support, marketing/media support, and payment control services, as well as arranging insurance cover for patients and investigators. 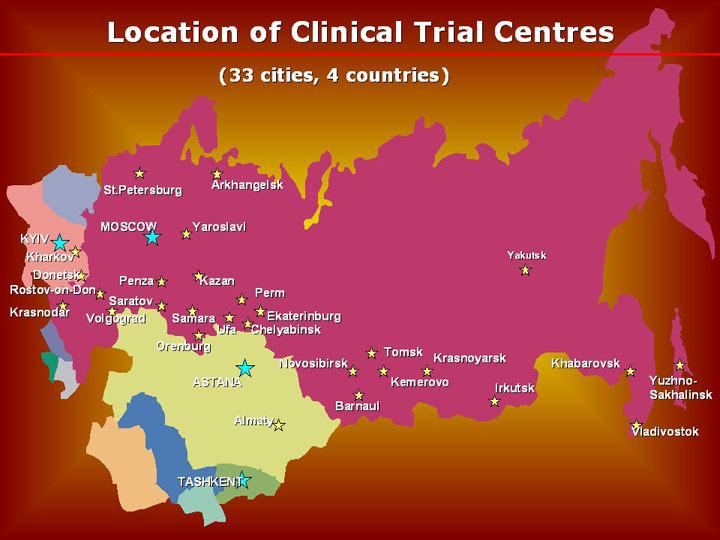 MatrixPharm has a unique database that includes information about more than 1500 clinical research centres and investigators in Russia and the CIS. You will find more detailed information about our services on the other pages of this website. If you cannot find the service you need listed here, it does not mean that we cannot provide it! The lists of services outlined on our website are not exhaustive. Please contact us and we can help you to meet all your clinical research needs. Copyright © 2005-2007 MatrixPharm. All rights reserved.